I shared an interesting discussion with Daniel Vollenweider over the nature of the riesling grape on my second day in the Mosel region. Previously he had spent time working in wineries in New Zealand and the United States, and he couldn’t understand why the New World considered riesling an aromatic variety. Tasting many of the wines from the Mosel and seeing how complex they can be, it isn’t hard to understand his point. But an investigation on Wikipedia classifies the variety as aromatic, and in other regions such as Alsace they may classify it as such too.What then is an aromatic variety. The literal interpretation would be that it has more bouquet than a complex wine, but this isn’t necessarily the case. It is perhaps more pertinent to consider the nature of the winemaking, whereby it is generally fermented in stainless steel tanks, and sees no barrel maturation. The complexity comes in the variety itself, the environment (such as the minerals in the soil), and from bottle age. So in this sense riesling could be considered complex, much like chardonnay (complex variety) from the Chablis region. I guess the difference with riesling wines from the New World is that they are almost always consumed young. This would make them aromatic in nature, as they have little inherent complexity, compared to wines from the Mosel. What are your thoughts on the topic? Dr. 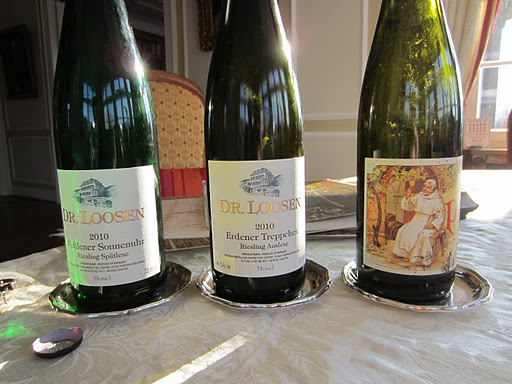 Loosen is a name synonymous not only with the Mosel region but also German wine in general. His Dr. L Riesling is one of the modern success stories of the wine world, penetrating many markets including the elusive Asian market. The range of estate wines is extensive, so I was very excited to visit to have an opportunity to expand my horizons. Ernst Loosen took over the running of the 200 year old family business back in the late-80s, stepping away from a career in archaeology. 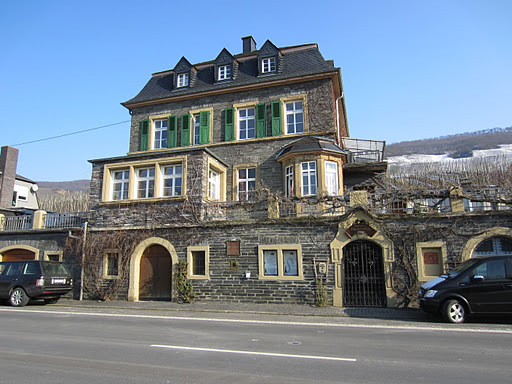 Based in the Middle Mosel village of Bernkastel-Kues, Dr. Loosen owns prime vineyards from which to source his fruit, and the majority of the estate wines are single vineyard wines. Having vineyards in a number of locations also allows Loosen to have access to different expositions and soil types, and there are several distinct slate (lay) types. The winery has been relocated, ever since the cellars got flooded back in the 90s, and the historic building is now used to welcome guests and house Ernst when he isn’t travelling around the world promoting his wines. I was met by Michael Stahlmann, a former sommelier, who was brought in nine years ago to help Ernst welcome visitors, particularly when he is not around. Considering his background Micahel was one of the most engaging and knowledgeable hosts I have had on my trip, and provided a unique perspective not only on the wines but also on their place in the minds of consumers. We started with two trocken wines; the blauschifer (blue slate) and rotschifer (red slate) rieslings from the 2010 vintage. 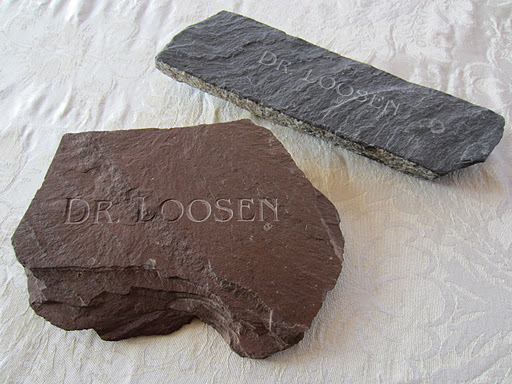 In comparison the red slate wine had more concentration, complexity and mineral influence, whereas the blue slate was cleaner, fresher and softer. As we moved through the tasting, we looked at wines from five different vineyards; Urzinger Wurzgarten (GG and Kabinett); Graacher Himmelreich (Feinherb); Bernkastel Lay (Kabinett); Whlener Sonnenuhr (Spatlese); and Erdener (Treppehen Auslese and Pralat Auslese Godl Cap). It was fascinating to see the nuances of the vineyard, style and vintage on each wine. The wines all showed great purity and focus, with balance, finesse and approachability. Great wines, full stop. I headed south again for my second appointment of the day, back to the banks of the Ruwer. Much like my hosts the previous morning, Maximin Grunhaus has a very long history. 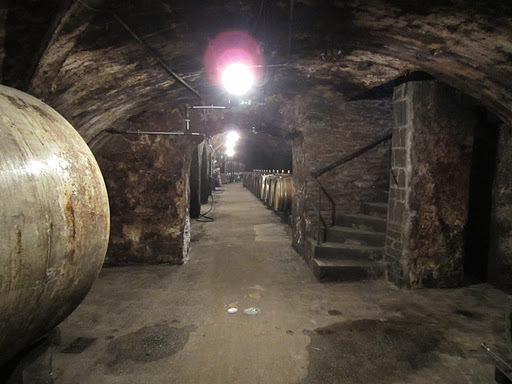 The cellars in which they operate were built by monks over 1,000 years ago, and it was run by the Abbey of Saint Maximin until Napoleon reclaimed and divided all the vineyards up between the people in the early 19th Century, much like he did in Burgundy and Champagne. The winery has been run by the von Schubert family since the end of the 19th Century, and it is done so in a very traditional and respectful way similar to the monks. The fruit comes exclusively from the Ruwer estate, and like most of the wine from the Mosel, is grossly under-priced. Many within the company have retreated to either the snow or to warmer climates, so I was looked after by a young guy from the cellar named Sebastian. He spoke reasonably good English, so I wasn’t able to ask a lot of technical questions. I mostly had to settle for him showing me a selection of wines from several vintages. 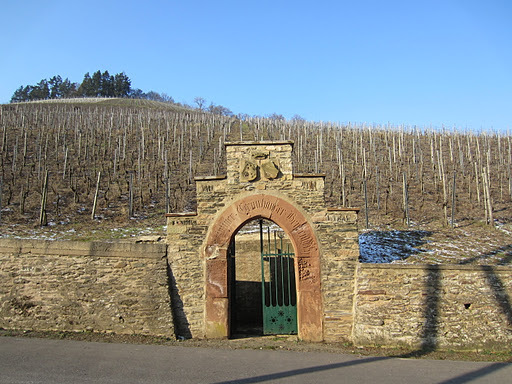 Standouts in the huge range were probably; the Alte Reben Trocken 2008, a wine that comes from vines over 50 years of age, exhibiting a lovely textural viscosity and soft yet fresh acids; and the Herrenberg Auslese No. 49 2006, which had a ripe floral and kerosene nose, and some interesting cheese complexity on the palate. Seeing the cellars was pretty amazing, particularly the museum and the rows of fuder along the walls. 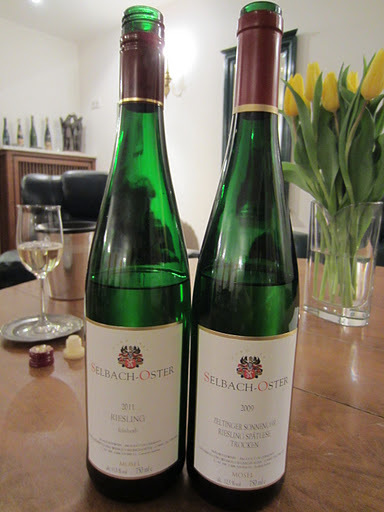 In spite of how busy she was with her husband in market and reduced staff, Barbara Selbach was nice enough to invite me to meet her to introduce me to Weingut Selbach-Oster. The family has been in wine-growing for over 400 years, but it wasn’t until Barbara and her husband Johannes Selbach that the Selbach-Oster name came into existence for winemaking when the family business was split. Located in Zeltingen, they own a total of 20 hectares of vineyards on steep, south facing slopes in the heart of the Middle Mosel. 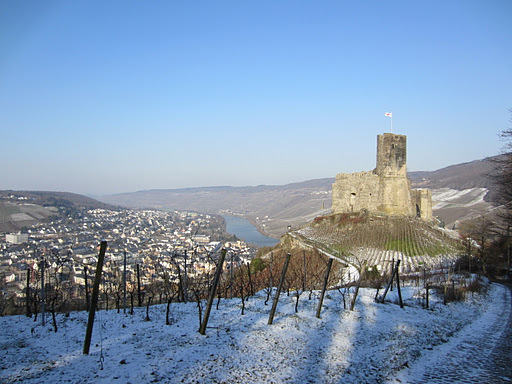 The Mosel region didn’t suffer the ravages of phylloxera as badly as other European regions, possibly due to the extreme climate and difficult soil conditions. For this reason, many vineyards are on their own rootstocks and are much older than in other regions. At least 50% of the Selbach-Oster vineyards are ungrafted and low-yielding. The winemaking philosophy is fairly simple; to harvest the best fruit at the optimum ripeness to produce wines of purity, elegance and flavour. 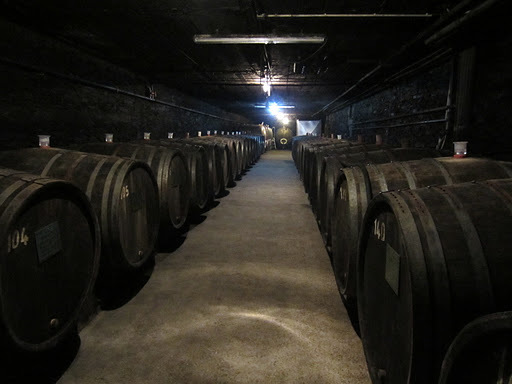 They use minimal intervention techniques such as gentle pressing, predominantly wild-yeast fermentation in very old fuder barrels, and settling and fining with cooling rather than centrifuge. As always the quality comes from selective harvesting in the vineyard. Most of the wines come from single vineyards, which allow the nuances of the vintage to express itself differently depending on the exposition of the site, and the soil type underground. Barbara showed me several wines from the range, mostly from the top vineyards of Wehlener Sonnenuhr and Zeltinger Sonnenuhr. One thing I have learnt this week is the importance of vineyards designated as Sonnenuhr, which are the most south-facing in the region. Historically sundials were built in the most south-facing slopes so that the workers would know what time of day it was, and the word sonnenuhr means sundial. With more sun exposition these vineyards are more likely to achieve ripeness and therefore higher quality in the German quality system. The Zeltinger Sonnenuhr wines from the Selbach-Oster range have lovely floral aromas, but are quite subtle in their minerality. In tasting the wines I explained to Barbara the meaning of the word austerity, and why it is perfect for explaining wines from the Mosel, especially the wines of Selbach-Oster. Click here to see more photos from Day Three of the Mosel Valley, Germany.